A friend gave me a video recently, of the legendary progressive bluegrass group Muleskinner. It was shot in Southern CA in 1973. It featured Peter Rowan, Bill Keith, Richard Greene, and David Grisman. That's almost three decades ago, and all the players were already in the virtuoso category. 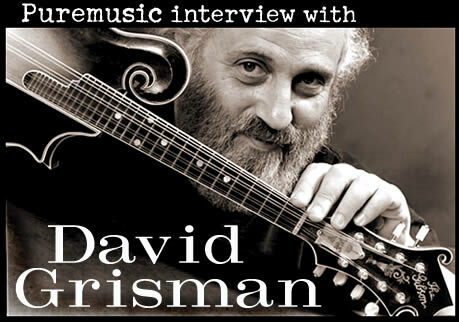 This perspective was in play when Rob Bleetstein from Acoustic Disc and I started talking about a cover interview with Grisman to help celebrate the release of Dawgnation, the first new album from the David Grisman Quintet in seven years. Even for a recognized musical personality and virtuoso, it's a tricky business to play and record a handful of styles simultaneously. David's dual brainstorms were to label his mixed bag "Dawg Music," and to start his own label way back in 1990 (with old friends Artie and Harriet Rose, and manager Craig Miller) called Acoustic Disc. In the dozen years to follow, many small companies strove to follow their example, and few have equaled their success. Acoustic Disc recently shipped their fiftieth release, five of which have earned Grammy nominations. Dawg Music incorporates swing, bluegrass, latin, jazz and gypsy styles. The musicianship of the quintet is such that they move through all these worlds fluently, with grace and humor. Jim Kerwin on string bass, Matt Eakle on flute, Joe Craven on violin and very assorted percussion, Enrique Coria on nylon and steel string guitar, and David Grisman on mandolin are individually and collectively capable of creating all the colors necessary to a group that sounds like they came from many countries and many times. On top of a brilliant collection of ensemble arrangements, Dawgnation features duets between David and each of the quintet's members, a very interesting and satisfying touch. Five of the records in his catalog were done with his old friend Jerry Garcia, some of Jerry's last recordings. (See our review of Shady Grove.) There are a lot of precious moments, on many levels. The actual catalog of Acoustic Disc is so deep with mastery, it's almost daunting. But no need -- at their website you can listen to two complete tracks from every CD, it makes picking the right selections so easy. There may be many CDs by people with whom you're unfamiliar. Bios of all the artists are a click away. It's all set up in a very user friendly way, a paradigm of independent marketing that feels like a mom and pop record shop. So bookmark www.acousticdisc.com, and go there to check out a world of excellent and beautifully produced recordings, including the work of the Dawgmeister himself, naturally. What follows is a phone conversation from his home in Northern California.